Enjoy Utah! : Disney On Ice Is Next Week! Disney On Ice Is Next Week! 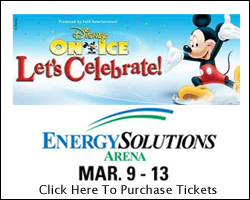 Disney On Ice Let's Celebrate is only a week away! It begins next Wednesday March 9th and runs through Sunday March 13th. We have our tickets....do you have yours?! If not, get them as soon as possible! Congratulations again to all our winners, and thanks to Lulu Hart with Feld Entertainment for sponsoring this amazing giveaway and the opportunity to see the show!